Old depot buildings in Chichester's Priory Park will be demolished and the park's Coade statue repaired while proposals to carry out further improvements are investigated further. 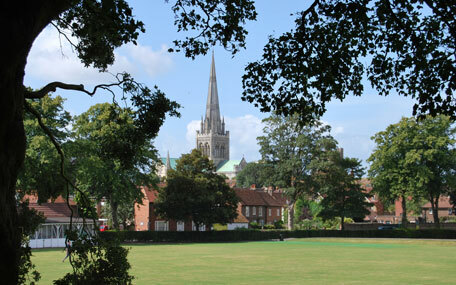 Chichester District Council's Cabinet discussed the wider scheme at its meeting on Tuesday 5 June. The approved work was part of a bigger scheme to enhance the north west corner of Priory Park, with the aim of improving its facilities from 2020 onwards. This area of the park contains several outdated buildings, including an old storage and maintenance area. The aim was to remove or refurbish them and then open out the refurbished space to a variety of community uses including a café in the brick pavilion. Cabinet decided that it was too soon to make a decision on the wider enhancement scheme. They have agreed to put it on hold until the planning position regarding the temporary café facility in its present location is resolved. The planning permission for the café is due to expire in 2020. Meanwhile work to remove the old depot buildings and repairs to the statue will go ahead. Councillor Tony Dignum, Leader of the Council, said: "Over the last year we have been liaising closely with groups who use the park, including the current café owners, about ways in which we can improve the facilities in this area of the park for everyone who uses it. "After the cricket club vacated the brick pavilion in 2016, the council, as landowners thought this would be an opportunity to look at this area as a whole. The aim was to see how we can make better use of the buildings and space, and open it up more. "At the moment, with the planning issues unresolved, we have given the go-ahead for only part of the project. We will continue to liaise with all the groups involved and keep people informed." removing the old depot buildings. Demolishing the current depot, public toilets and café buildings. Constructing new public toilets and a roller store. Turning the brick pavilion into permanent use for a café and also providing space for community uses including existing clubs currently using the park. Part of this area would be returned to parkland which would help improve the sightlines, views and accessibility. The white pavilion on the southern edge of the park would also be refurbished.